Thanks for choosing our free CDL practice test. While other websites will charge you, all our informative CDL test and resources are always free. If you’re looking to become a truck driver, your at the right website. Truckers Logic has hundreds of informative resources for new and veteran truck drivers. This is our first free CDL practice test. This free CDL test covers CDL general knowledge questions. In total, there’s 40 questions with multiple choices. The answers to our CDL practice test are at the bottom of the page. Don’t forget to bookmark this page so you don’t lose it. Before you get to your CDL test, we know what it feels like to go through this whole process. The CDL training and testing process can be mentally exhausting. If you make a commitment to study for your commercial drivers license, you shouldn’t have any issues at all. Don’t forget to ask the Department of Motor Vehicles for your CDL study manual. We also know that you may have a lot of questions and not know where to start, so here’s some great CDL resources to keep close. We have articles and resources on the entire CDL training process. There’s a few different ways that you can get your commercial drivers license. Truckers Logic also has information and resources on truck driver training schools. Truck driving schools are a big part of the CDL training process. You want to ensure that your going to a top tier trucking school. Below, we have several links on driver schools and information that will properly prepare you. Thanks for your interest in our free practice CDL test. Below, you’ll find our 40 question CDL test. Just so your aware of the CDL testing process, each state has different test. It all depends on your local DMV office. One state may have 50 questions while another has 75. We suggest that you take time to contact your local DMV to find out how many questions will be on your CDL test. If you don’t know where your local DMV office is, try the DMV office finder. 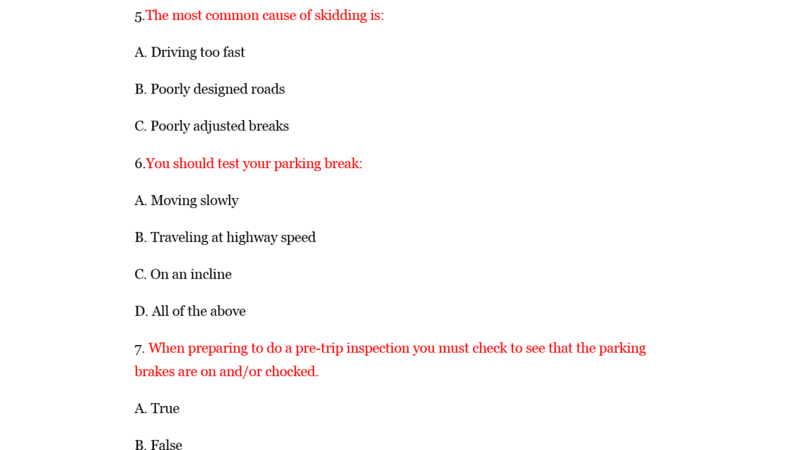 1.Which of these can cause the vehicle to skid? 7. When preparing to do a pre-trip inspection you must check to see that the parking brakes are on and/or chocked. A. Make sure the parking brake is on. B. Put gearshift in neutral (or park if automatic). C. Start engine and listen for unusual noises. 10. Retarders keep you from skidding where the road is slippery. 12. What is the proper way to hold the steering wheel? A. Safety for yourself and other road users. 37.How is the phrase gross combination weight gathered? 38.If you lose hydraulic pressure and brakes, what should you do?